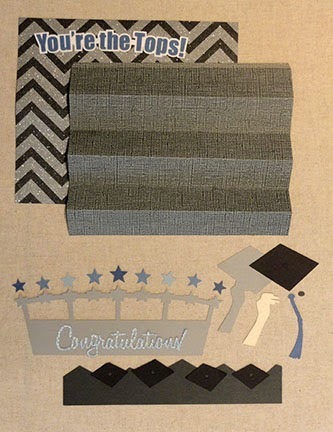 that you can create with your favorite grad in mind. Card size fits in a standard no.10 office card (approx. 3.75" x 8.875" folded). that has some extra depth interior space to allow for the layers. to the front edge of the main card shape. 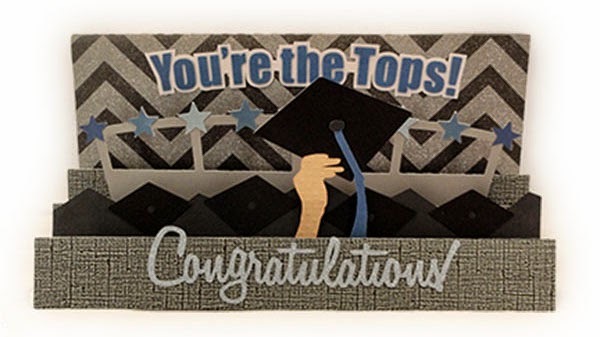 "You're The Tops!" layered sentiment on the card face. 2. Layer the word letters on the offset base shape. Fold the card base shape. Center and glue to the top of the front of the card. 3. Fold the step section with alternating valley and mountain folds as shown. Fold tab as "valley" fold. 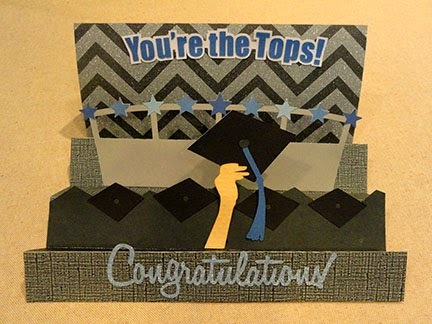 Join the steps section to the lower front edge of the card front, gluing the tab under the card's edge. 4. 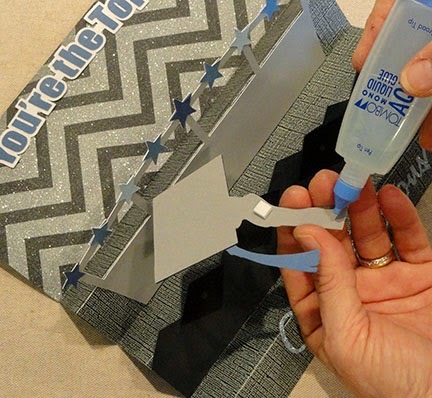 Assemble the star arch by gluing the matched star shapes over the arch star shapes. 5. Assemble the "crowd" strip by gluing the extra cap squares at the top edge as shown, aligning edges that correspond. 6. Assemble the hand and cap shape by layering onto the base silhouette shape in order: a. cap square; b. hand; c. tassel; d. cap button. 7. Center and glue the assembled units onto the step section as shown, back to front: star arch (align bottom edge at crease); crowd section (align bottom edge at crease); "Congratulations!" word cut out on front step, approx. 1/4" above front edge (tall letters will extend above the front step ridge). 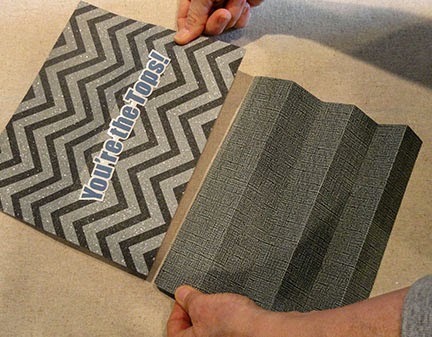 As each addition is added, test fold at the "valley" crease to make sure the card will still fold at crease easily. 8. Glue the hand unit in place. 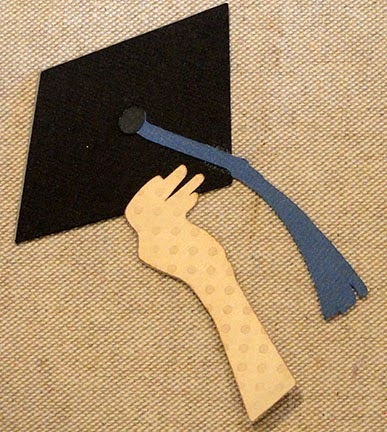 For added dimension, consider adding a dimensional adhesive square or dot behind the hand, as is shown on this sample. I prefer liquid glue at the arm bottom edge so that it can be tucked at the crease and still not interfere with the folding and closing of the card steps (that is, in place of two dimensional adhesive squares). 9. Fold/collapse the steps to check that this happens without interference with crease. The card was sized to fit into a standard No. 10 office envelope. However, you may wish to consider using the dimensional long envelope that has "boxing" gussets at sides and bottom to allow for the extra thickness of this dimensional card. I purchased this svg file but I can't figure out how to attach the optional holder for money. Do you have a photo or instructions? To use this card as a money bill holder, you will use the card front/base shape that is at the right of the download file shapes INSTEAD of the "plain" card base shape that is at the left side of the shapes collection. The money-holder substitute shape has a fold-over decorative ends strip that will be the place the money can tuck behind. 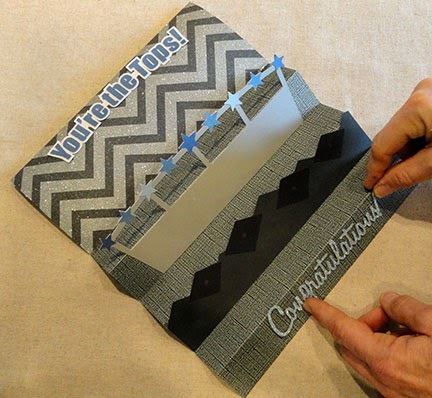 In the file as it opens, the fold-over strip part is at the top of the shape, but when you create the card, this strip will be at the bottom of the inside of the card. 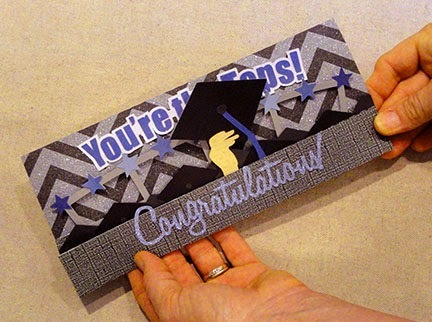 Fold it on the perforation toward the inside of the card, that is upward, then attach brads through the hole punches that align with holes on the inside of the card.